With Evelyn's birthday fast approaching we were very excited to be approached by the lovely people at Party Bags & Supplies and given the opportunity to review one of their party packs! 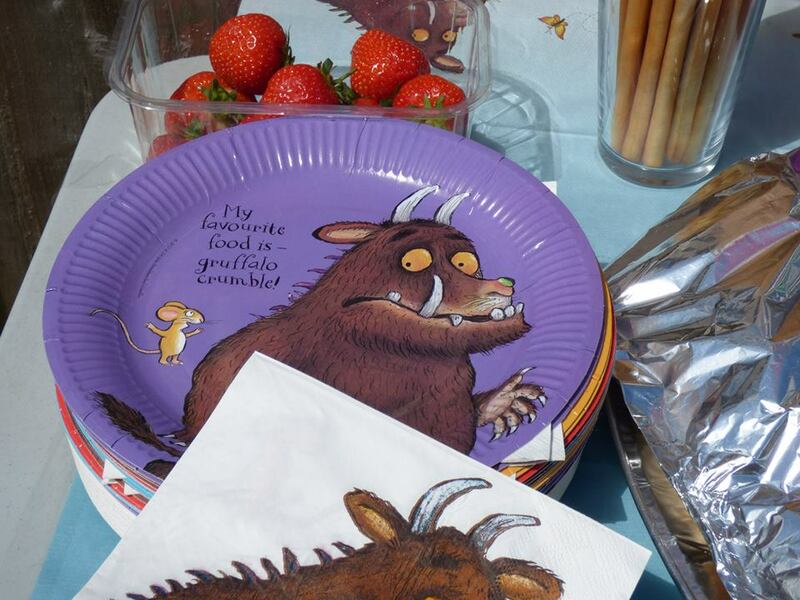 As Evelyn had a Gruffalo themed party we of course chose the Gruffalo Party pack which has an RRP of £28.40. 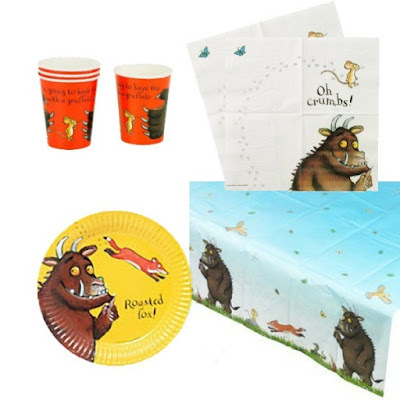 The Gruffalo party pack contains 8 Cups, 8 Plates, 20 Napkins & 1 Tablecover plus 8 The Gruffalo filled party bags. All of the items in the party pack where great! The party pack arrived well packaged and all items arrived in perfect condition, the party bags are pre filled which saves you a job! I loved how bright and vibrant the colours were in the Gruffalo party pack and all of the items seemed of high quality, the cups and plates especially although disposable were strong and sturdy and of good quality. 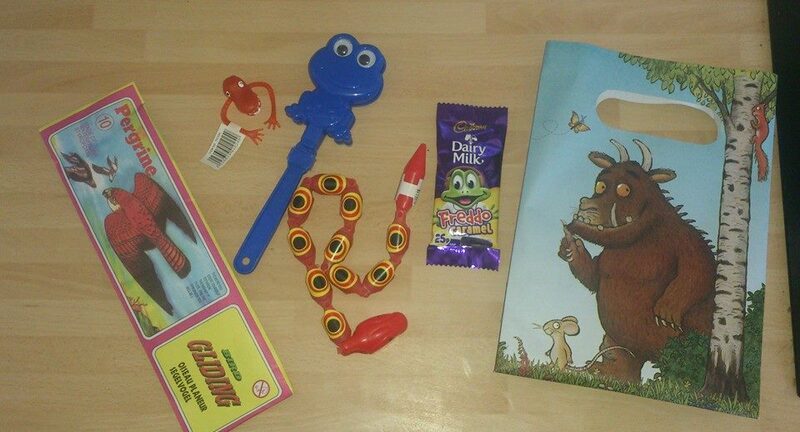 Inside of the party bags contained a bird glider, a sneaky snake, a frog clapper, a finger fright puppet and a Cadburys caramel freddo bar. These were most definitely a bit hit with the slightly older children and it was great to see the party bags filled with a few fun toys rather than just sweets! 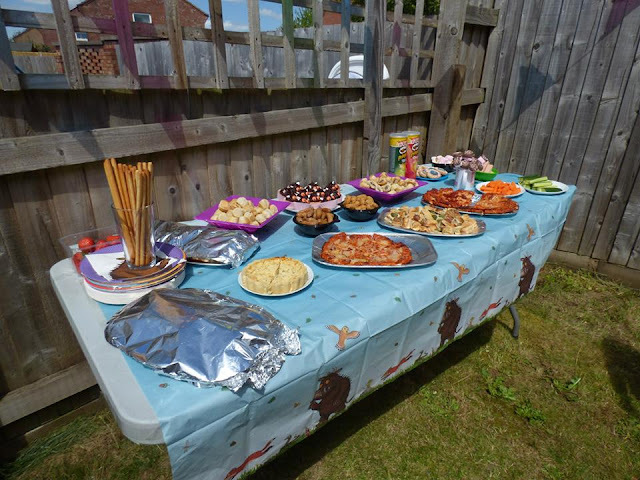 The gruffalo items went down great at Evelyn's party and everyone complimented us on the items. I did find I needed to purchase more plates and cups and found it a little strange to receive 20 napkins but only 8 plates as most parties will have more than 8 guests. However the website makes it easy to purchase any extra you may need and at fairly reasonable prices. If you would like to purchase other items to compliment the products inside the party pack you can also purchase items such as Gruffalo candles and Gruffalo invites on the Party Bags & Supplies website, all at really reasonable prices. Also thank you to Viccy for taking some of the photos shown above at Evelyn's birthday party! 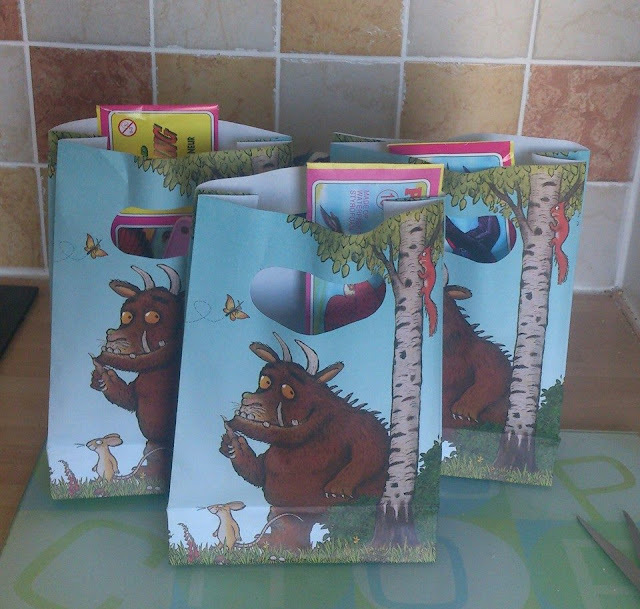 I love how you kept all the bags themed without going over the top - the gruffalo is always a winner.